The event takes place 6 to 9 p.m. this Thursday, Nov. 15, and will showcase about 10 pop-up chefs based in New Orleans. Roulaison Distilling Co. will have a pop-up tasting room, and spirits from Bizou Wines, Urban South Brewery, and Broad Street Cider will also be available. 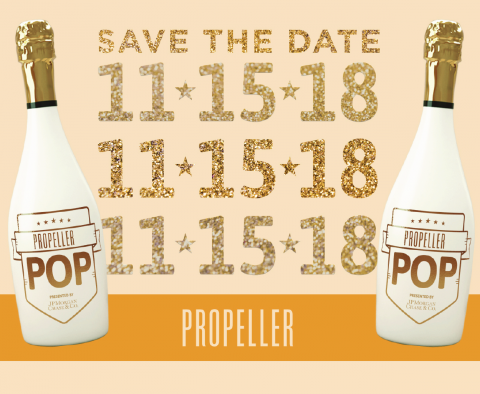 Propeller Pop will begin with Patron Hour from 6 to 7 p.m.; it will feature entertainment by the Preservation Hall jazz quartet and hors d’oeuvres by this year’s Chef Honorees, the Vilkhu Family of SAFFRON NOLA. The Patron Hour auction will feature items from Saba Restaurant, KREWE, New Orleans Athletic Club, Mignon Faget, Ltd., Bacchanal Wine, Sneaker Politics, and more. Chef pop-ups for the event will include: 2BrothersOneLove, Avila Grill, BeetsNThyme, Big Boyz BBQ, Black Pearl Tiki, BuKoo Buns, La Vie En Rose, Matchbook Kitchen, Ryan Universe, Seasonally Savvy Kitchen, and Union Ramen. Propeller is located at 4035 Washington Avenue. General Admission begins at 7 p.m., and tickets are $35. Patron tickets are $100 and include general admission. See Propeller Pop 2018 for tickets and more information. PROPELLER is a New Orleans-based 501c3 nonprofit that grows and supports entrepreneurs to tackle social and environmental disparities. Since 2011, Propeller has accelerated over 200 entrepreneurs, 71% are women or people of color. Their ventures have created over 460 jobs and generated over $105 million in revenue and financing, with investment from VCs including Kapor Capital and Founder’s Fund.